If you’re a fan of smokey, wood-fired flavor, you’re definitely going to want to look into getting a wood pellet grill. It runs on a different type of fuel and makes smoke by incinerating hardwood pellets. We’ve separated out the best wood pellet grills that are available right now, so you could leave the research to us! But before we get started, here are some things that you should know about wood pellet grills! Temperature Range: This is how high or low the temperature in the grill can go. This will tell you if it can make some of the recipes you’ve looked at because different temperatures produce different and unique flavors. Multi-Function: Is it just a smoker or does it perform other functions? Examples would be that you could also make bake a pizza with it, or braise your meat before cooking, or even roast entire turkeys. More is better! Cooking Surface: The cooking surface is how big a space is available for spreading food out to cook. A larger cooking area is best for larger meat selections or more pieces of meat and vegetables as well. Temperature Control: When a grill has temperature control, it means that you can set the heat to a certain number of degrees and it will stay there, giving you the optimal cooking atmosphere inside the grill. Size: These are the dimensions of the grill, which will give you a good idea of where it will fit on your porch. It will also tell you how large the grilling surface usually is, which is useful. Warranty: The warranty protects you and your purchase from manufacturing defects. If something goes wrong or breaks within the warranty period, you’re covered for a refund or replacement grill. It’s a nifty insurance feature for your purchase. Now that you know all there is to know about wood pellet grills, we can show you our reviews! We’ve chosen the best grills to make sure that you’re getting the most out of your outdoor cooking experience. While this list is full of amazing grills, the top pick and budget pick are our favorites. We know that you’ll find your new favorite outdoor cooking device here! Have fun making great food with these grills. Our pick for the best wood pellet grill is this Z Grills model. It comes in an attractive bronze and black color, and a free cover to keep it nice when the weather gets bad. It has a combined total of 700 square inches of cooking space, which is managed by the automatic electric feed system. This helps the grill maintain the temperature that you want without you have to babysit it while it’s working. There are a warming and smoking rack, as well as a twenty-pound hopper. We love that this grill can do a fair amount, from grilling to smoking, baking, roasting, searing, braising, chargrilling, and finally barbeque. It even has an auto-start ignition, so no part of using this grill is difficult or daunting. We love that! The waste oil collector is another neat feature that helps to make cleanup a breeze. The wheels on the bottom help you move it where you want it as well! One of the best rated wood pellet grills on our list is also one of the most affordable. The Camp Chef Deluxe Pellet Grill comes with so many features and options that we were blown away! You can do so many things with this multi-function grill, including braising, baking, roasting, and smoking. It has a digital temperature control so that you can keep it hovering anywhere you want to, in the range between 160 degrees and 500 degrees for the perfect taste. You can control it with the touch of a button, and that’s pretty neat. 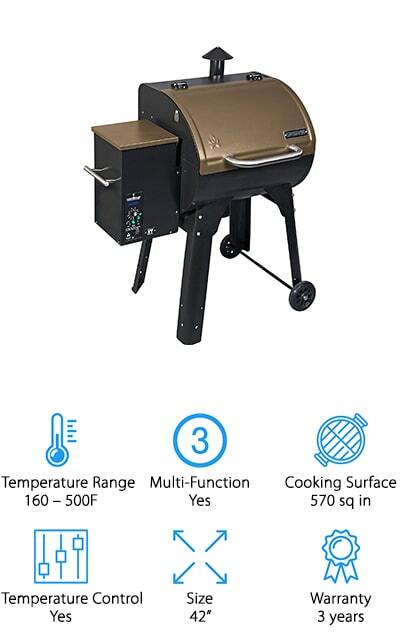 It’s easy to assemble and has a cool feature where you can pull a certain lever and clean the ash out of the grill quickly and easily, so there’s no delay between cooking sessions. We love it! You’re sure to get delicious food off of all 570 square inches of cooking space, including a warming rack, an upper rack, and of course the grill! No list of outdoor cooking equipment would be complete without some RecTec wood pellet grill reviews. 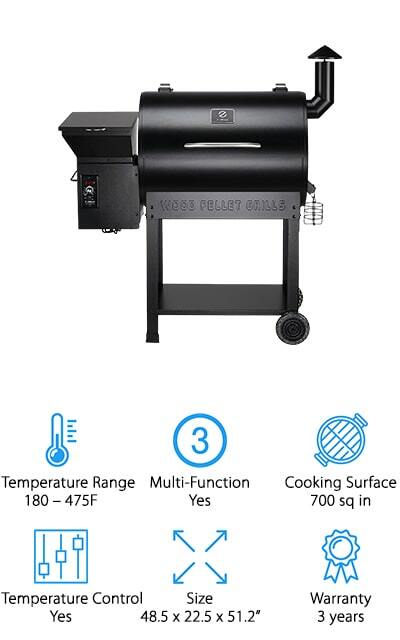 They’re a well-known company that provides quality grills, and this one is absolutely full of features. This particular stainless steel grill is a bundle and a great deal! For the price, you get a Wi-Fi-enabled grill that you can totally monitor from your phone inside the house. It has wheels so you can move it to wherever you want to grill without any issues. It has a front folding shelf that you can use to hold trays and other implements, and the hopper can hold about 40 pounds of pellets. Speaking of, you also get four 40-pound bags of wood pellet grill pellets in this bundle, which is an incredible value that we’re sure you’ll appreciate. It also comes with a neat cover for keeping all of your grilling surfaces protected from damage. It doesn’t get much better than this Rec Tec grill! Another essential to make any sort of pellet grill list credible is the Pit Boss wood pellet grill review. It’s a huge grill, with an amazing 820 square inches of grilling space. It also includes flame broiler so you can sear your meat over the open flame. The grid of the grilling surface itself is made of cast iron coated in porcelain, so you’ll be getting a lot of flavors directly from the meat and seasonings themselves. It can cook your meat to temperatures between 180 and 500 degrees without breaking a sweat. The temperature control dial has LED readout so that you can get really accurate readings. 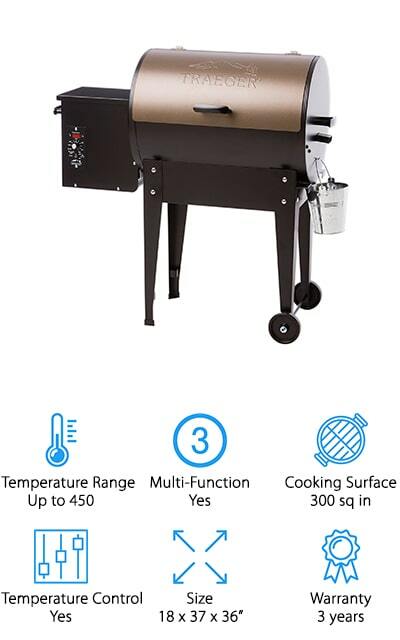 You can also smoke, bake, and roast in this grill, and that versatility paired with the huge cooking surface makes this one of the best wood pellet smoker grills that we could find! The hopper can hold 10 pounds of pellets at a time, which is a manageable amount! Z Grills is on our list again with the smaller version of our top grill. Even so, the decreased size does not detract from this being one of the top rated wood pellet grills on the market right now. This thing has eight different features and cooking options, as well as an automatic temperature control so that you can keep it sitting at a specific temperature without having to babysit it. 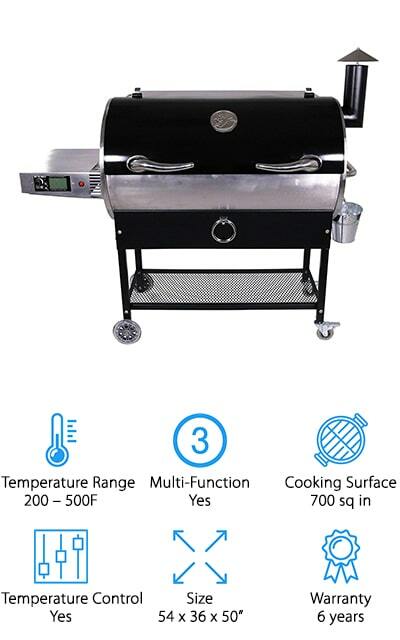 It has an upgraded control system where the control board can ignite the grill automatically and you won’t have to keep an eye on the grill as long as it’s set to the proper temperature. The hopper can hold twenty pounds of pellets and there’s a large grilling area, a total of 700 square feet. You can put all of your steaks and chickens on there at once so that you don’t have to do multiple different long cooks! This grill is still large and full of features! The Cuisinart Wood Pellet BBQ Grill is a beautiful piece of equipment that is small enough to cook for just your family and portable enough to wheel to a neighbor’s house for a cookout as well. It’s a black grill with golden accents, which really makes it look classy. It comes with two shelves: one on the side and one on the front for all of your trays and other things, including grilling forks and spatulas. The handle on the other side of the hopper makes it easy to lift and move as much as you’d like. That hopper can hold up to 15 pounds of pellets, which is enough to make dinner for a smaller gathering of people, such as a big family dinner. It even comes with a holder for the grease bucket. It’s the perfect grill for entertaining, and it covers all your bases: baking, braising, smoking, and barbeque. 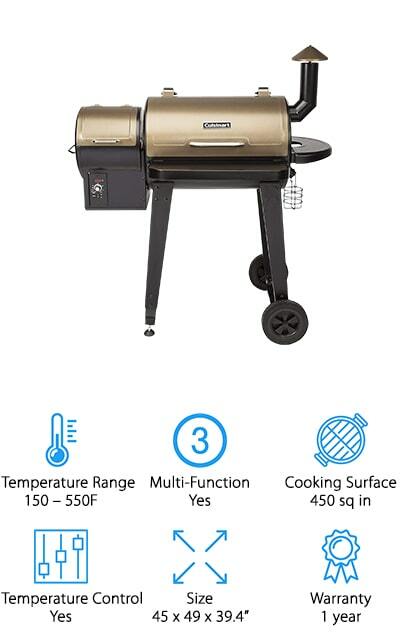 It’s a great pellet grill! The Green Mountain Davy Crockett grill is definitely the most portable grill on our list. It’s got a smaller cooking surface, but that means that it’s a great miniature option for tailgate parties or other outdoor events. The folding legs are portable and can double as handles to move your grill around. It’s Wi-Fi enabled, so you’re always going to be able to monitor the temperature due, completely up to the thermal sensor that gives you constant, accurate temperature readings from inside. 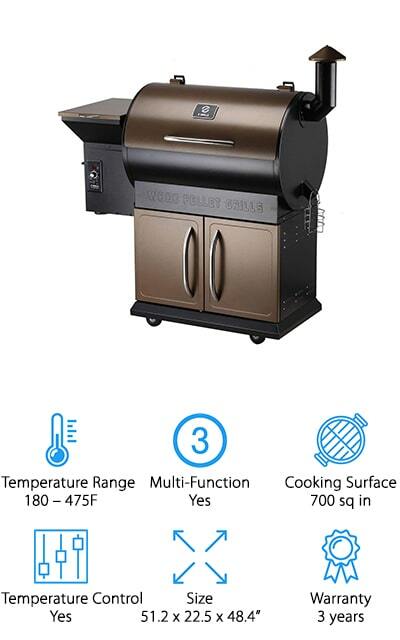 It’s also an electric wood pellet grill with three different power options. 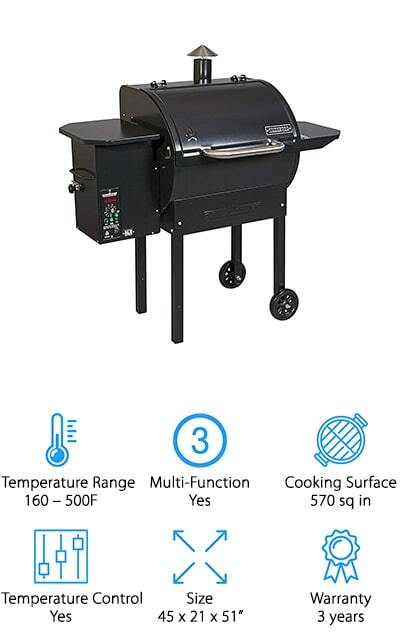 The ability to choose how the grill is powered makes this a great grill for tailgating, as well as the fact that it’s only 57 pounds and extremely portable. It even comes with a meat probe so that you don’t have to buy a separate one! We love that they’ve thought of everything to make your grilling experience wonderful! It’s a pretty amazing portable grill! This Traeger wood pellet grill would be a great addition to your outdoor cooking devices. It has about 300 square inches of cooking space so that you can cook a large amount of food at a time. 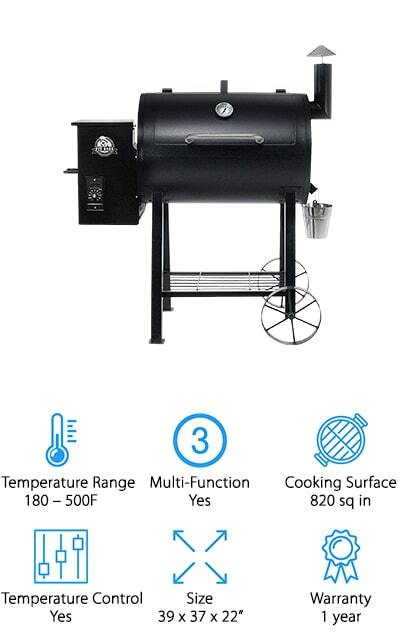 And it doesn’t just grill, either – the Traeger Junior also smokes, bakes, roasts, braises, and barbeques so that you don’t have to have separate devices for each of those things. It has so many different temperature and time settings so that you can get the perfect taste no matter what you’re cooking. The digital temperature controller keeps the heat hovering within twenty degrees Fahrenheit so that you don’t have to babysit it and you can easily change it. You can use it just about anywhere because it’s also extremely portable! Our list would not have been complete with this Traeger wood pellet grill review! There’s nothing more satisfying than a pure wood-fired taste that you simply can’t get from gas or charcoal. Camp Chef is back on our list again with the SmokePro grill in a beautiful bronze color that’s going to look great on your back porch. It has a huge temperature range, from 160 degrees to 500 degrees, to allow for smoking or grilling. This unit can produce up to 25,000 BTUs of heat to get all of your cooking done right the first time! It’s got a digital controller for the temperature and an LED readout chamber so that you can see exactly what the temperature is at any moment during the cooking process. Camp chef is also a well-known company that makes many accessories for the grill so that you always have what you need on hand without fail. It’s got smart smoking technology so that you can easily adjust and change the temperature for your perfect taste! The ash cleaning system is automatic and you won’t have to use the vacuum to clean your grill any longer! 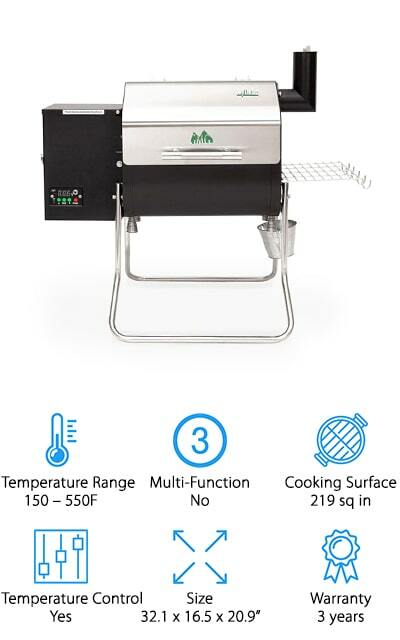 This wood pellet smoker grill by Cookshack is completely stainless steel and is put together by rivets. This creates a nice look that’s sure to look great in your backyard and resting on your back porch. There are stainless steel grates for durability as well as nickel-plated racks so that you get a great taste on your meat without the influence of cast iron ones. There are 784 square inches of grilling space, including a warming drawer and three different areas and racks to cook your food in. You can control the temperature electronically so that you can get rid of those unwelcome, large heat fluctuations. It can get up to an amazing 36,000 BTU temperature, and we think that’s pretty amazing! 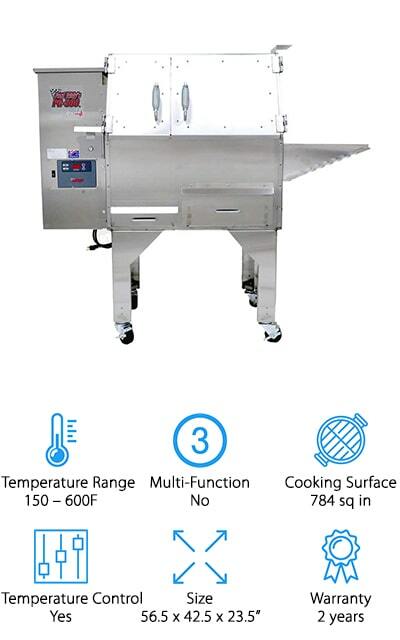 It even has a draft fan so that you can further control temperature and atmosphere, in order to make the perfect meat each and every time once you get the hang of it!